ในสัตว์เลี้ยงลูกด้วยนม สัตว์ที่มีสมองที่ใหญ่กว่า (โดยขนาด ไม่ใช่เพียงแค่ขนาดโดยเปรียบเทียบกับขนาดกาย) มักจะมีเปลือกสมองที่หนากว่า แต่ช่วงความหนาจริง ๆ ก็ไม่ต่างกันมาก คือแค่ประมาณ 7 เท่าระหว่างคอร์เทกซ์ที่หนาที่สุดและที่บางที่สุด สัตว์เลี้ยงลูกด้วยนมที่เล็กที่สุด เป็นต้นว่าหนูผี มีความหนาของคอร์เทกซ์ใหม่ประมาณ 0.5 ม.ม. และสัตว์ที่ใหญ่ที่สุดคือมนุษย์และปลาวาฬฟิน มีความหนาของคอร์เทกซ์ใหม่ประมาณ 2.3—2.8 ม.ม. ↑ Tomer, R; Denes, AS; Tessmar-Raible, K; Arendt, D (2010). "Profiling by image registration reveals common origin of annelid mushroom bodies and vertebrate pallium". Cell. 142 (5): 800–809. doi:10.1016/j.cell.2010.07.043. PMID 20813265. ↑ Shipp, Stewart (2007-06-17). "Structure and function of the cerebral cortex". Current Biology. 17 (12): R443–9. doi:10.1016/j.cub.2007.03.044. PMID 17580069. สืบค้นเมื่อ 2009-02-17. ↑ Gilbert CD, Sigman M (2007). "Brain states: top-down influences in sensory processing". Neuron. 54 (5): 677–96. 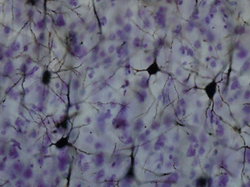 doi:10.1016/j.neuron.2007.05.019. PMID 17553419. ↑ Cauller L (1995). "Layer I of primary sensory neocortex: where top-down converges upon bottom-up". Behav Brain Res. 71 (1–2): 163–70. doi:10.1016/0166-4328(95)00032-1. PMID 8747184. ↑ 14.0 14.1 Jones EG (1998). "Viewpoint: the core and matrix of thalamic organization". Neuroscience. 85 (2): 331–45. doi:10.1016/S0306-4522(97)00581-2. PMID 9622234. ↑ Creutzfeldt, O. 1995. 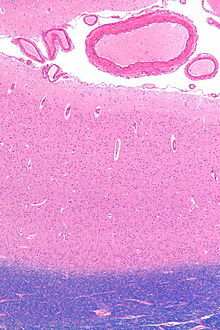 Cortex Cerebri. Springer-Verlag. ↑ 16.0 16.1 Lam YW, Sherman SM (2010). "Functional Organization of the Somatosensory Cortical Layer 6 Feedback to the Thalamus". Cereb Cortex. 20 (1): 13–24. doi:10.1093/cercor/bhp077. PMC 2792186. PMID 19447861. ↑ Mountcastle V (1997). 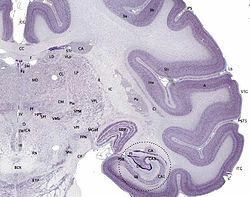 "The columnar organization of the neocortex". Brain. 120 (4): 701–722. 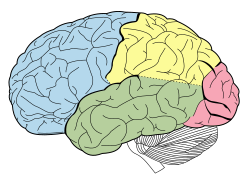 doi:10.1093/brain/120.4.701. PMID 9153131. ↑ S.M. Dombrowski , C.C. Hilgetag , and H. Barbas. Quantitative Architecture Distinguishes Prefrontal Cortical Systems in the Rhesus Monkey.Cereb. Cortex 11: 975-988. "...they either lack (agranular) or have only a rudimentary granular layer IV (dysgranular)." ↑ Sun W, Dan Y (2009). "Layer-specific network oscillation and spatiotemporal receptive field in the visual cortex". Proc Natl Acad Sci U S A. 106 (42): 17986–17991. doi:10.1073/pnas.0903962106. PMC 2764922. PMID 19805197. ↑ Saladin, Kenneth. Anatomy and Physiology: The Unity of Form and Function, 5th Ed. New York: McGraw-Hill Companies Inc, 2010. Print. ↑ Dorland’s Medical Dictionary for Health Consumers, 2008. ↑ Cathy J. Price (2000). 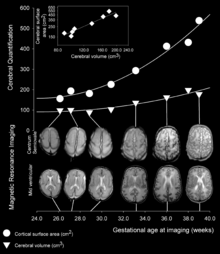 "The anatomy of language: contributions from functional neuroimaging". Journal of Anatomy. 197 (3): 335–359. doi:10.1046/j.1469-7580.2000.19730335.x. Catharine Paddock (2007-11-20). "Migraine Sufferers Have Thicker Brain Cortex". Medical News Today.